WELCOME TO SKY HIGH'S GUIDE TO FINDING YOUR STYLE. WE UNDERSTAND THAT IT CAN BE DIFFICULT TO NARROW DOWN AN EXACT THEME FOR YOUR RENOVATION OR NEW BUILD. BELOW ARE SOME OF RENDERS PRESENTED IN AN CONTEMPORARY STYLING. WE HOPE THIS HELPS OUT. SUGGESTED FINISHES - CEMENT GLASSFACE, VERVE, GRANULAR MARBLE, TRAVERTINE AND ARTWORK. RECOMMENDED FINISHES - CEMENT GLASSFACE, VERVE, GRANULAR MARBLE, MARMARINO. A focus on detail requires dramatic use of materials, execution of clean lines and creative use of both color and texture as the secret to re-defining contemporary design while retaining interiors that remain inviting and comfortable. TO MATCH YOUR RENDER PROPERLY PICK YOUR FURNITURE AND STYLING TO MATCH. HERE ARE SOME STORES WE LOVE TO HELP WITH THAT. CLICK AWAY! Colour Palette - Establish a colour palette that combines contrasting colour with a series that flow together. You may go one step above and consider the style of the elements you are placing together. In the case above the timber and cushions are rustic so the colour range is adjusted to also be dusty and rustic. Consider the colour of your render. Place it into your colour palette at the beginning and reference its colour subtly throughout your room. Layers, layers, layers. - Polished plasters such as Glassface, Verve, Marmarino and many others from our range can be used subtly or intensively. For a contemporary format we recommend the use of lighter colours in large amounts to create textured backdrops. 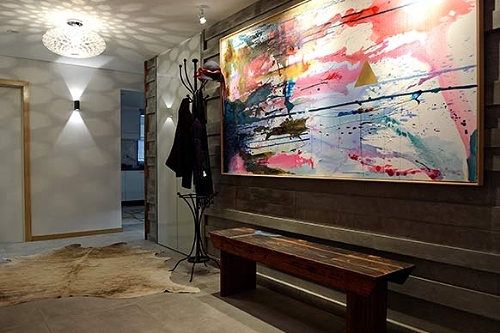 Placing art in front of a polished wall will give you that balance you require to create a sharp contemporary look. Soft timber, such as Tasmanian Oak, mix beautifully with busy renders. Horizontal lines of Cement Glassface combine with splashes of colour.